Will N-Trig DuoSense Power the Apple Tablet? Filed to: DuoSense to Power Apple tablet?Filed to: DuoSense to Power Apple tablet? DuoSense to Power Apple tablet? Abigail Solomon: Yes, N-Trig is in discussions with other leading brands, but we are not in a position to discuss who. JD: What kind of companies? AS: Well, not only notebook makers. N-Trig's technology is not limited just to notebook PCs. Think gaming, handhelds, medical devices, TVs, computer screens... anything with a screen. 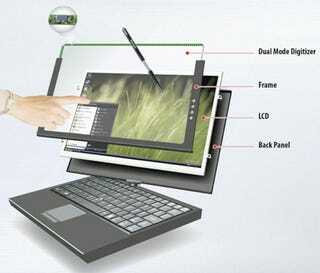 JD: How does this technology compare to Wacom's pressure sensitive displays, which seems like the current leader? I know theirs is not capacitive touch, but I thought their pen technology was unmatched. AS: N-Trig's sensor materials are combined with sophisticated software algorithms which enable true digital touch and can be easily be integrated and supports any type of LCD or size. JD: But does your pen require a battery? AS: The pen is an electrostatic pen, so no, it doesn't require a battery. The stylus is light, ergonomic and customizable and requires no internal power source. It has an integral sensor that changes transmission frequency in accordance with tip pressure, which has a more natural, hassle-free and life-like pen experience. It also features right-click and eraser capabilities. JD: How many pressure levels does it support? JD: Does it support tilting and bearing like the Wacoms? AS: No, the pen does not support tilting and bearing since it isn't required by the operating system. However, in terms of touch performance DuoSense introduces outstanding accuracy and full compatibility with Microsoft Vista requirements and features. JD: How does the dual input work, having to cope with the hand touching the surface while using the pen? AS: We have a feature called "intelligent digital palm rejection," which enables the user to switch seamlessly between the pen and the touch functionality. The DuoSense displays knows when you are using the pen or expecting it to react to your finger input. As you can see, this technology is completely new and totally different from what current tablet manufacturers have in the market now. So new in fact that when we first talked with N-Trig back in October, they were still in the process of ramping up manufacturing and couldn't even discuss the technology in detail. The Israeli company, which has offices in Tel Aviv, Taiwan and Austin, had Dell lined up at the time, as well as other undisclosed OEMs. The ability to have electrostastic, battery-free pen input with 256 levels of pressure and being able to seamlessly switch from pen to hand back to pen without a hitch is quite unique, to the point of justifying a price much higher than that of regular pen-based devices. More importantly, it feels natural and simple. That simplicity is what got me thinking that, if the rumors and patents hold any water, a company like Apple would have to use DuoSense or something equivalent to it, if it exists. It's one of those things that Steve Jobs would set as a requirement for any portable with multitouch and ink (pen writing) capability, the latter already supported in Mac OS X. Right now, the only game in town is Dell, and even then, the new Latitude XT doesn't have multitouch support—yet. There has been some speculation about why the Dell doesn't support multitouch at this point, with some people blaming Vista for the lack. While it's true that—thanks to system-wide programming interfaces—future multitouch support in Vista will make things easier for any program to support the capabilities of the DuoSense, we're told, "Vista is not the issue." According to N-Trig, "All it takes is a firmware upgrade and it's ready to go," like the pressure levels. Why not throw it all in, then? At this point, N-Trig offered up the obligatory "This is all we are allowed to say at this time," which makes us speculate that it was a strategic decision due to the lack of multitouch-enabled apps. Surely all this secrecy must have a very good reason.